Naoko's Journal: Foods in Uji! I'll show you what we ate in Uji. Uji-city is very famous for its local product, teas! First, we tried icecream cones. 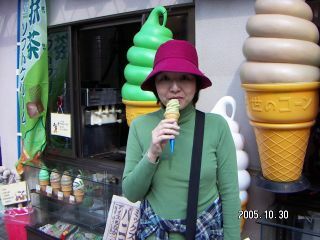 This is a green tea cream cone with me! 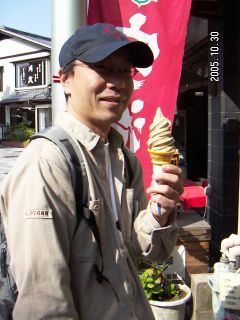 And this is a Hoji-tea cream cone with Takao! They were wonderful! Especially we liked the Hoje-tea flavor. It had a really pleasant aftertastes. 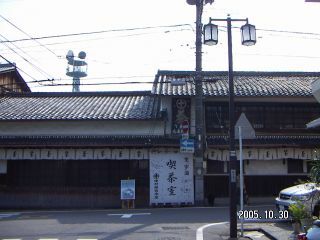 This is a traditional style tea shop. 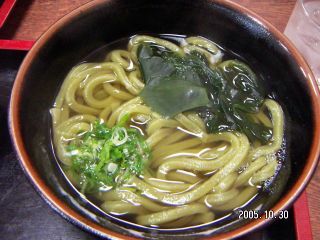 For lunch, we ate grean tea flavoured noodle. It was tasty. 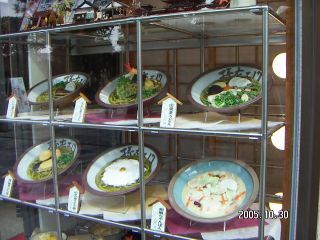 The samples are mostly made from wax. I haven't seen these kinds of things in other countries. Is it uniquely seen in Japan? Maybe....? Let the whole world move forward. Nekoneko:difficult new words for me! I live in Osaka, Japan. I've been studying English to communicate with people of all over the world. I started this blog to improve my English, to introduce my life here, and hopefully to meet new people!